Shortest Day at My House in Amsterdam, 1970. Color photographs, 70 3/8" x 84 7/8"
(178.8 x 215.6 cm) framed. The camera records something quite different from what we see. There are no rectangular formats in nature, only in art (paintings, sheets of music or poems, windows, ravioli), and only if we choose to look at it that way. For Perspective Correction, My Studio I, 1: Square on Floor, 1969, the earliest work in the show, Jan Dibbets taped an upside-down trapezoid (in relation to the camera) on his studio floor and took a photograph (the work) so that the trapezoid, distorted by perspective, appears to be a square. It's difficult not to think of it as a square, and no reason not to, despite the inward-slanting walls. In a way it is a joke about the preeminence of the picture plane in contemporary art, whereas, of course, the perception of Renaissance perspective still prevails, or at least still resides, or better yet is still the place where we and the artist reside. Despite the square, our eyes take us into depth to the windows and their light. There are windows within a window presaged by another window. Without really destroying our illusions, the artist has interrupted reality, or intervened to almost imperceptibly create another reality, something in the back of the mind that forces us to accept both realities. The artist introduces himself (takes control?) by making a square out of a trapezoid in his own studio. The trick is an elementary one, a wan display of the human imagination. But it suggests something more elemental, in itself and in works to come. The camera records something quite different from what we see. There are no rectangular formats in nature, only in art (paintings, sheets of music or poems, windows, ravioli), and only if we choose to look at it that way. For Perspective Correction, My Studio I, 1: Square on Floor, 1969, the earliest work in the show, Jan Dibbets drew an upside-down trapezoid (in relation to the camera) on his studio floor and took a photograph (the work) so that the trapezoid, distorted by perspective, appears to be a square. It's difficult not to think of it as a square, and no reason not to, despite the inward-slanting walls. In a way it is a joke about the preeminence of the picture plane in contemporary art, whereas, of course, the perception of Renaissance perspective still prevails, or at least still resides, or better yet is still the place where we and the artist reside. Despite the square, our eyes take us into depth to the windows and their light. There are windows within a window presaged by another window. Without really destroying our illusions, the artist has interrupted reality, or intervened to almost imperceptibly create another reality, something in the back of the mind that forces us to accept both realities. The artist introduces himself (takes control?) by making a square out of a trapezoid in his own studio. The trick is an elementary one, a wan display of the human imagination. But it suggests something more elemental, in itself and in works to come. In the subsequent works, there are no more tricks of the kind that require manipulating the subject directly, but there remains the square of the camera and of the artist's continuing intervention. Dibbets moves from his studio to his living room in Shortest Day at My House in Amsterdam, 1970. 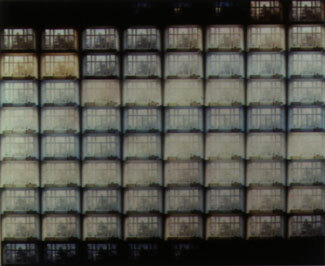 This work has an eight-by-ten grid of 80 horizontal rectangular photos of the room, or rather of the mullioned street window and radiators, taken at intervals throughout the shortest day of the year. The photos start out dark and become lighter from the top left, continue with a great deal of light throughout the center photos, and then fade to dark in the bottom right. Why the shortest day, and why therefore are there not more dark than light photos? Because the shortest day, like the square, concentrates vision, compressing light into a few hours, and the point is to see, not to be engulfed in darkness. Light triumphs, or at least struggles, against the dark, as it relates to the artist's desire, and ours. Land 0° --135° , 1972.
each 35 1/2" x 35 1/2". Land 0° --135° , 1972, is a horizontal row of ten square photos of the same flat meadow landscape, typical of most Netherlands' topography. The first photo has a level horizon, the rest grade up, left to right, to 45 degrees in the fourth square, 90 degrees in the seventh one, and finally 135 degrees in the last one, tipping the landscape back over to almost upside-down. Geology has been replaced by photology, as Dibbets has turned the camera a few degrees each time in the succession to create incline, which eventually turns back on itself. The earth turns no less deliberately, though perhaps more inevitably. each 80 3/8" x 80 3/8"
(204.2 x 204.2 cm) framed. The fact that the surfaces photographed in the three "Colorstudies" of 1976 are expanses of automobile hoods or doors is irrelevant but immensely important. Dibbets doesn't hide what they are; strips of chrome appear, as do molded shapes, a bit of window, and gaps between segments of metal. These are not the only surfaces that might be used in such a way, perhaps, except that they are essentially contemporary, like the camera itself, ubiquitous in modern life, exemplary of modern movement, and singular in their reflective and coloristic qualities, as the sculptors John Chamberlain and Donald Judd understood before Dibbets. But, where Chamberlain and Judd see hardness and impenetrability, Dibbets sees translucence and immateriality. In the large Colorstudy, with a horizontal row of four square color photos on paper, each measuring 80 3/8 inches by 80 3/8 inches framed, the colors are car versions of light brown, red, blue, and dark brown and are unimaginable in any other form. One sees into the expanses of color, which seem to contain another world. They are reflective of course, but it is only barely possible to make out what the reflections might be, of trees, of lights, of people. Images get mixed up with irregularities of the paint, scattered smudges of dirt, and other things that might be in the surface itself. There is something in the color, another world. The photo surface corresponds with the car surface, and somehow we expect to see our own images, or something approximating our own images in the reflection. Maybe we do. We are in the work, just as the artist is. Everything Dibbets does proves our own existence beyond ourselves, however precariously. The exhibition was on view at Barbara Gladstone Gallery, 515 West 24th Street, New York, NY 10011.